Menus are so much more than a list of the food and drink you serve. With the right design they can actually help sell your food and drinks, introducing customers to your specialities and leading them through the courses and options and encouraging them to be adventurous. A simple design or logo is the mark of the sophisticated restaurant, and a flamboyant design with pictures of the food can be more appropriate to cafes and fast food venues. It's all about letting the menu set the tone for the meals you serve. What is nine + eight? There are three types of card to choose from with varying price and quality. Our standard menus are good for most uses, however for those extra special occasions where a little extra expense is entirely appropriate our laminated range is the best choice. If durability is less of a concern and you wish to be environmentally friendly our recycled range is ideal. The minimum order quantity is 10. Are the menus digitally or lithographically printed? It depends on the quantity you order. The latest digital printing techniques make small runs far more economical. Gone are the days when only lithographic printing offered the standard of finish required and it was necessary to produce high numbers to make the unit costs practical. The high quality of modern digital printing now means small digital runs of 10, 25 and 50 are now quite feasible, making regular updates and developments easy which in turn improves your opportunities to profit from offers and seasonal variations. 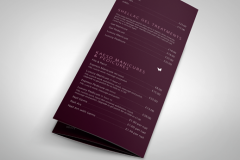 Menus are printed in A4, A5 or DL. What is the advantage of having a laminated menu? A gloss or matt lamination waterproofs the menu, keeping them looking smarter for much longer. What is the difference between matt, gloss and velvet lamination? Essentially if you think of lamination like your trusty household emulsion. You have the following finishes. Gloss leaves your print with a high shine, that leaves a high end impression. Matt leaves your product with an smooth and flat finish for those a classy understated looks. Whilst velvet is the farrow and ball of the print finishes, ultra smooth flat finish, luxurious to touch and is a real vintage show stopper. What is the difference between a flat and folded menu? 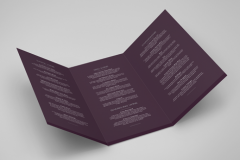 A flat menu has no folds, so it essentially a front and a back. It therefore cannot have multiple pages. Yes, simply call our office on 0333 8000 888 and let us know your requirements. We will be more than happy to provide a sample. Yes, please feel free to download a menu design template to help you format your ideas in just the right way for printing. With the design of your menus being so influential in helping your customers choices, you may like to engage the help of our professional design and marketing team. They specialise in treating each venue as a unique and exceptional business and will provide inspiration and ideas to make sure your design stands out from the competition. To find out more about how they can help simply fill in the quote request form or call the office on 0333 8000 888.